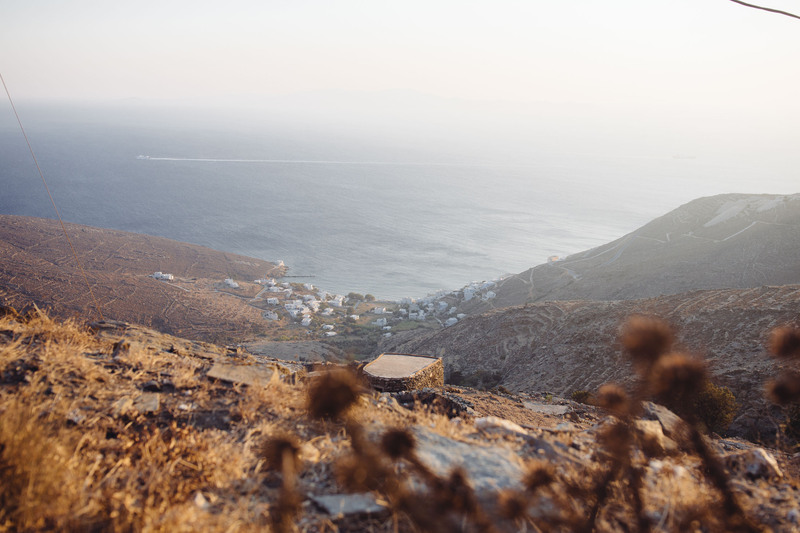 The Greek island of Tinos is no secret; Athenians pilgrims have been coming here for centuries, crawling on their knees from the ferry boats to visit the miracle-giving icon of the Virgin Mary in the church at the top of the hill. But for travelers like us, seeking a different sort of miracle, Tinos is just starting to come into focus. We were introduced to this island by a friend who travels a lot. He’s a fashion photographer and is on a flight about every three days. He said Tinos was his favorite place he’d ever been and we thought, since he’s been nearly everywhere, it was worth checking out. 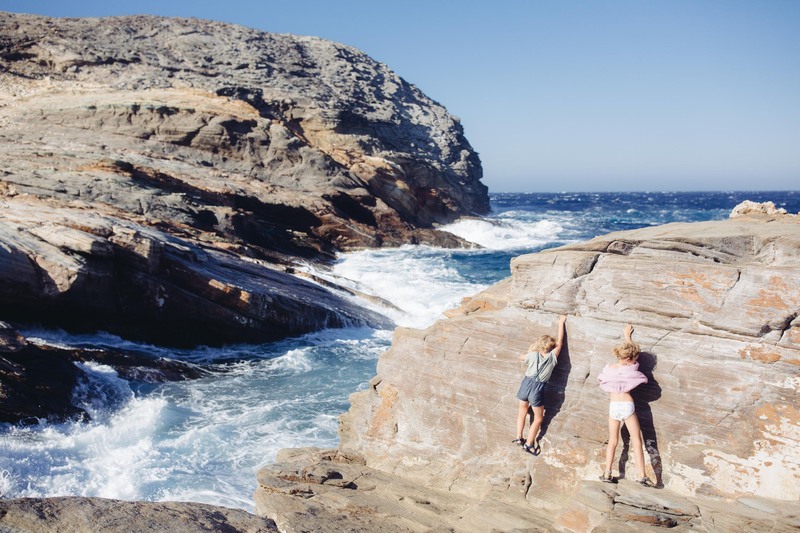 We fell hopelessly in love with this magical island during our two week stay last Autumn, and decided we needed to come back with other, like-minded families. We will host two weeks of QC Family Gatherings on Tinos in June/July 2019. We’ll collect a small group of like-minded families together in one property, with incredible food and wine, a pool overlooking the Aegean and some truly special moments planned throughout the week. Check out the Gatherings page for details. Antonis, mid-60’s, his skin brown and taut over smooth cheeks and generous belly, asked the question with his whole body. He stood tall and stared hard with clear eyes the color of the Aegean behind him, as if he were made of it. He had just walked out of the sea, shining in salt water and sun and we stood chatting while he dried in the warm breeze. And he gave no ground. 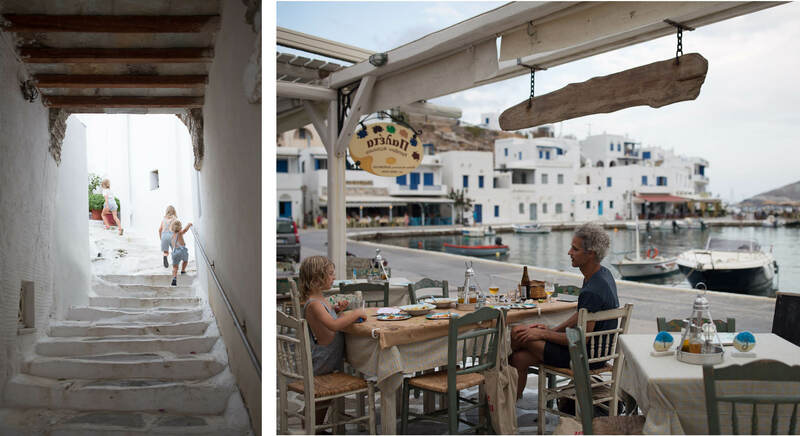 We had arrived on Tinos a few months after having sold everything we owned to travel the world with our three children (this is as much fun as you would think but also way harder than we ever imagined). We’d followed our noses down the long dirt track to this empty beach and taken turns working on charged up laptops, going for swims and keeping 2-year-old Viggo from either jumping off the highest rocks or filling his mouth with rocks and sea glass. The beach was empty when we arrived, but soon Antonis and his wife emerged from the sea and came up to say hello. We told him we ARE building tradition and community. It just looks different. Instead of the same sea and the same daily routine our kids are shown the same values, the same love and the consistent, deliberate patterns of interaction. We also do have community, but it’s global and digital, with highlighted punctuation of real life get togethers. We may say many goodbyes and hellos, but we’re carrying all of these relationships with us. Our first Family Gathering, held in October here in Morocco, was proof that we can build community around values, and we’re still connected to everyone who came. At the same time, we hear his criticism and feel the sting of lack of family around. It’s Christmas, our favourite time of year, and we feel upside down. We’re here in Morocco and there are no decorated houses, no Christmas trees, no carols spilling from shops or windows, no Christmas parties to go to. The flag, mercifully, is a shining green star on a bright red background, so we’ve adopted that as a silent ode to the holidays. But our family has never felt further away. The kids don’t know their grandparents well enough and the family stories we share with them are things they listen to, not live inside of. (They LOVE hearing stories of how we grew up!) We’re trying to remake some Christmas traditions; tonight we laid in bed in the single room we all share, with the fire glowing, singing carols. When we got to “sleep in heavenly peace” in Silent Night, Viggo, hearing “heavenly” sat up and said “KEVIN?” and we all laughed. It may not be the Christmas we know, but it will be one we remember. We have lots to learn about how to raise these three. Perhaps we’ll change our mode, or have many different modes… in the last 24 months we’ve lived on a boat, an island farm, a Mexican apartment and a riad in Morocco. Clean clothes go back in the suitcase and the LEGO is bundled at the end of each day in its travel bag. We’re moving around a lot, but we carry our traditions and our values with us. We hope we see Antonis when we return to Tinos this summer. In some small way, and surprised as he may be to learn it, Antonis himself has become a part of our heritage.